7.25 points at 12 votes (rank 275). Happy Computer 9/85 - Test report without voting system! Our adventure starts here in the bedroom. "Keep them away from water!" "Keep them away from light!" "But the most important: No matter how much they beg! Never ever feed them after midnight - never!" ... but what happens then, we all know. Gremlins - The Adventure is a licensed adventure game by Adventure Soft from 1985, which is based on the movie from 1984. Mainly the game consists in the task to keep the Gremlins from terrifyingly devastating the town Kingstons Falls with all means and destroy them. On the foray through Kingston Falls the player gets to see again some settings from the movie. Kingston Falls is in danger of being over-run with Gremlins, Billy has been tricked by Gizmo's offsprings into feeding them after midnight. The Mogwai have already pupated and turned into the evil Gremlins, and, led by Stripe  (the evilist of them all) are now causing chaos all over Kingston Falls. By taking the part of Billy you are now about to embark on a most perilous adventure. 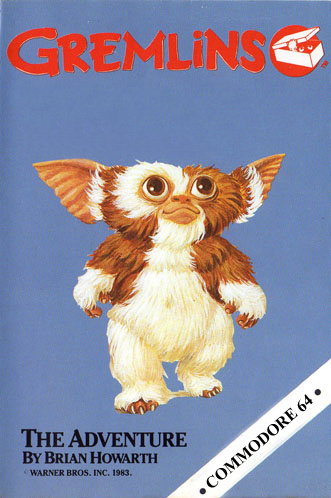 Aided by Gizmo it is your task to save Kingston Falls from being over-run with Gremlins. This adventure's buildup is typical for the genre Hi-Res/text. At the top of the screen there is a graphic, which is even partially animated and shows the current place. In the lower part of the screen the player gets a description of the things he sees in the shape of text. From this one can derive items with which you can interact. As often in the C64 era, a two-word parser was used for this adventure and there is the possibility to visit altogether 37 locations. We meet againg the 'Flasher Gremlin'. It is always recommended to leave behind items that you do not need any more, as it may lead to death out of the blue. After a certain number of given commands a "Gang of Gremlins" appears. You can provoke this with "WAIT". If one of these gangs is on your heels (They make themselves felt by the text "Oh dear! I have company...."), you can shake them off later with "PRESS BUTTON" (camera) for a short time. As long as the movie is shown in the cinema, you are not disturbed by the "Gang of Gremlins" for a certain time. The manual only supplies the player "a few useful words" and therefore these are only a couple of commands. Again only a choice of commands, but these are basically enough. 1. It is possible to enter several commands after each other divided by a comma (,). 2. You can write full sentences. When the Gremlins are watching a movie, you can walk through the town undisturbedly. In the movie the Gremlins multiply in this pool. We start in the bedroom where there is a Gremlin throwing darts. First we go down and kill the Gremlin with the sword. Now we have to go to the kitchen, where there are several things to do. If you want to take a look at GIZMO, you can do this with the command "LOOK GIZMO"
Now back again into the bedroom to kill the Gremlin with the knife and get the torch. Now out of the house and we head towards the tavern. Now go behind the bar to get the camera and the pipe. At the latest since now there is a group of Gremlins waiting outside for us, to occupy them for a while wie go to the cinema and start the movie. Now go to the car workshop to get the gas bottle and the welding torch. Now go home into the garage and destroy the snowplough so you cannot be rolled over. Next we have to let out the water in the swimming pool. HINT: If Gremlins appear you can put them to flight again with PRESS BUTTON. ... to then go to the store next door to get the hacksaw unhurriedly. With the hacksaw we now go to the mailbox and cut it. With the plates from he cut mail box we go back to the store and weld closed some of the outlet shafts. Now we have to start the movie for the third time. Now we have won some time to close the rest of the shafts. ... to start the movie again in the cinema. ... to close further shafts. Now we wait in the room with the last open shaft to shoo them into the shaft with the flashlight. Now we can kill the Gremlins with the gas. Now we go outside and wait for the explosion. Stripe now starts running and jumps into the pool in which, fortunately, there is no water any more. On the internet circulates the "Cheat Mode" POKE 4298,84 SYS 4096. This could not be verified with the emulator and the cracked versions. 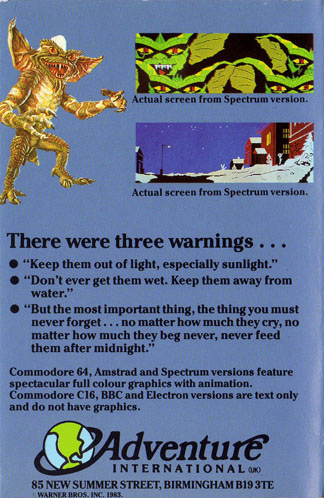 Wecky: "I was a Gremlins fan a that time (and I am still one :D) and jubilant to be able to get hold of this game. But it was and is damn hard to play. I never really got very far. However, each newly reached setting was a small success for me. I found the graphics for those times very successful and the mood of the movie was also there. Objectively speaking, the puzzles are not really done well and you often only proceed by "try and error", which can be frustrating very quickly. E.g. if I do not leave the sword in the house I will always be killed in the bar (and you only think, huuuuuhh?) Unfortunately, the end is also unimaginative, I would have wished for more here :-( I give the game 7 out of 10 points (due to the graphics and the Gremlins factor)". The English C64 version has a bug but can be played to the end. If you simply type "GO" you arrive at the corridor of the store. The German versions of the game by "The Syndicate" and "Dynamic-Duo" cannot be played to the end. The last 10 minutes of the longplay of the game.